A man has been charged with grievous bodily harm after a carjacking victim was run over with his own vehicle. 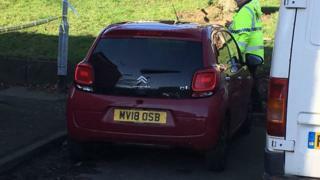 The 63-year-old, who gave chase as his red Citroen C1 was being stolen in Greater Manchester, is still in a critical condition. He suffered serious head injuries in the crash in Nook Lane, Ashton-under-Lyne at 07:20 GMT on Friday. Jackson Bogart, 46, was remanded in custody at Tameside Magistrates' Court. He has also been charged with theft. Mr Bogart, of Ladbrooke Road, Ashton-under-Lyne, will next appear at Manchester Minshull Street Crown Court on 18 March. A 45-year-old woman who was arrested on suspicion of assisting an offender has been released and will face no further action. Officers later found the red Citroen C1 on Parry Walk in Ashton-under-Lyne.